Whip out this crazy good whole 30 approved pan-seared salmon dish with simple creamy leeks and a perfectly poached egg any time of day to impress anyone -yourself included. Slice the fingerlings in half lengthwise and toss with oil, 2 cloves minced garlic, and salt and pepper. Spread evenly onto a baking sheet and cook until golden and crispy, 30-35 minutes, tossing once halfway through cook time. Meanwhile, coat a medium skillet with 1 tablespoon ghee and heat over medium. Add the leeks and saute for 5-7 minutes. Add the remaining garlic clove and cook for 30 seconds. Add the arrowroot powder and stir to coat everything. Whisk in the nut milk and add cayenne, mustard powder, and lemon zest. Allow to thicken over a low simmer. In an oven-safe skillet, heated over medium-high heat, add the remaining ghee. When the skillet is hot, place the salmon, skin side down and cook until the bottom is golden and crispy. Flip salmon and finish in the oven 5 to 7 minutes longer. While the salmon finishes, prepare the eggs. Bring a pot of water with a splash of white vinegar and salt to a low boil. Crack the eggs into individual small cups to make handling easy. Hovering just over the water, carefully slide the eggs in, one at a time and gently stir the water. Allow to cook 3 to 4 minutes. Remove with a slotted spoon and drain excess water. To serve, toss the potatoes with the arugala. 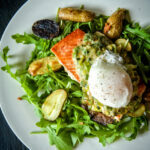 Top with the salmon, a dollop of the creamed leeks, and the poached egg. Serve.